Villa Vidorra is situated in the heart of hearts of the Rivera Maya. 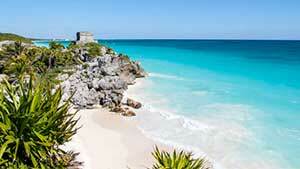 It’s located in the northern portion of Tulum and is about 35 minutes south of Playa Del Carmen. Because of this Soliman Bay enjoys the best of what this area has to offer. The Tulum Ruins are the third most visited historical site in all of Mexico, behind Teotihuacán and Chichen Itza. The Tulum ruins are often said to be the most well preserved Mayan ruins in existance. The ruins of Tulum are truly a spectacular site to behold. If the ruins themselves weren’t enough, the setting on the beach is a true place to declare Heaven. The shocking turquoise water and the bold black cliffs join to create an awe-inspiring picture. The archaeological site is one of fascinating exploration. Once thought of as a fortress, the ruins of Tulum are actually what once was a busy site of commerce. This was a walled city of laborers, astrologers, farmers and nobility. Explore the ruins by yourself or choose to hire a guide once your there. Entrance to the archeological site is around $5usd. You are free to swim or sun at the beach below the ruins, and there are many spots to take pictures and enjoy the view from above. These ruins are located halfway between Tulum and Valladolid in the interior of the Peninsula and is a 40 minute drive from Soliman Bay. The roads to Coba are wide and easy to drive. There are many small pueblos along the way where you can buy fresh fruit juice and handmade items. 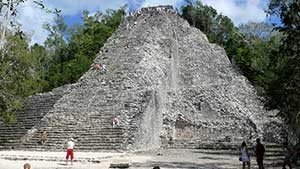 Coba was once an enormous city. The ruins are still mostly overgrown, which gives you an idea of what the ruins looked like when the explorers first rediscovered them. You can walk widened trails and rent bikes if you wish. Chichén Itzá was officially inducted as one of the 7 wonders of the world in 2007. 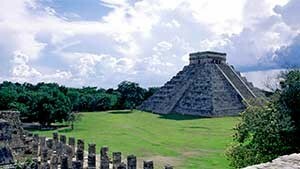 It is also included as one of UNESCO’s World Heritage sites and is the most visited historical site in all of Mexico. This sacred site was one of the greatest Mayan centres of the Yucatán peninsula. Throughout its nearly 1,000-year history, different peoples have left their mark on the city. The Maya and Toltec vision of the world and the universe is revealed in their stone monuments and artistic works. The fusion of Mayan construction techniques with new elements from central Mexico make Chichen-Itza one of the most important examples of the Mayan-Toltec civilization in Yucatán. Several buildings have survived, such as the Warriors’ Temple, El Castillo and the circular observatory known as El Caracol. While ruins, including pyramids El Castillo and Kukulcan, are the primary reason to visit Chichen Itza, there is a wealth of other attractions as well. Otherworldly bird-watching and stargazing experiences can be found within the Maya Jungle Reserve and in Hacienda Chichen’s Bird Refuge. Yaxkin Spa makes the most of this sacred space with holistic Mayan healing. 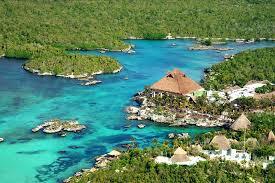 Focused around water and the surrounding environment Xel Ha is a great place to spend the day with your family. For a theme park, of sorts, XelHa has taken the opportunity to incorporate education, fun and relaxation amongst the sea and jungle. The park is like a giant natural aquarium with snorkeling, a river to float through centes, swimming with dolphins and much more. It has several restaurants and is an all inclusive experience. This enormous park is a fun and educational exploration of Mexican culture and traditions. It’s an all-inclusive experience which offers entertainment, great food, and a taste of all that Mexico has to offer. Here you can watch a traditional Fiesta Charra and the Mayan Ball Game or visit the jaguars on Jaguar Island and colorful butterflys in the pavilion. You can also enjoy the Caribbean Sea by taking a snorkeling tour, swim through underground rivers and have a unique experience at the Dolphin Swim. Xplor Cancun Park opened to the public in July 2009. It is next door to Neighbor Xcaret Park. All explorers can enjoy four incredible activities: zip-lines, amphibious vehicles, rafts and swimming in the underground river. All related to adventure and nature; these activities take place in a natural setting and outdoors. In addition, to the delight of the adventurers, they can find unlimited smoothies and juices in different parts of the park and enjoy a delicious and healthy buffet at the “El Troglodita” restaurant. 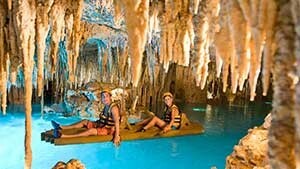 And for the most extreme visitors, Xplor offers a new experience that makes it possible to enjoy the sunset and night. Xplor Fuego Tour joins the best of two worlds in a night version that invites you to discover new emotions with additional ingredients such as the fire of torches, fireflies and stars that light up caves, paths and bridges. This national reserve must be one of the most beautiful places on earth. 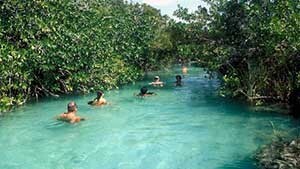 Located just south of Tulum and a short distance from Soliman Bay, this Reserve is a large protected area of over 200,000 acres and more than 65 miles of the Great Mayan Barrier Reef. 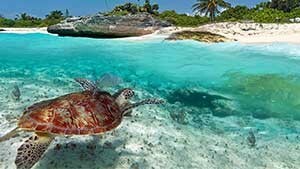 It includes stunning untouched white sand beaches along the Caribbean coastline, beautiful aqua blue lagoons, semi evergreen tropical forests, wet-lands, and savanna as well as an abundance of wildlife such as jaguar, flamingo, puma, toucans, ocelot, margay, the jaguarundi, howler monkeys, crocodiles and over 345 species of birds. The name Tulum, derived from the Mayan word for wall, and the ruins hovering over the beach, most notably the giant pyramid-shaped Castillo, have gained notoriety as 1 of the Mayan civilization’s only walled cities. In its heyday, Tulum served as a port of call for mariners and traders, and its walls defined the ancient town’s defense against invaders from sea and land. Today, visitors from across the globe who vacation at Tulum experience 1 of Mexico’s finest beaches with an added bonus: the chance to admire the architecture of the ruins and feel the awe of this ancient and notoriously advanced civilization. Once a sleepy beach outpost, Tulum has become a fashionable yet decidedly low-key escape to a bohemian paradise. During the past decade, stylish expats have set up shop, working with native craftsmen to build small trendy and unique shops, restaurants, and more. 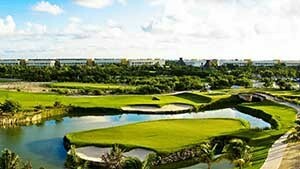 Playa del Carmen is one of the fastest growing and most fun towns in the Caribbean. An international mix of fun loving travelers come here to party, enjoy the beaches and just generally immerse themselves in the tropical splendor of it all. Playa del Carmen or “Playa“ as it’s known to the locals, is in the middle of the Riviera Maya, Mexico’s Caribbean vacationland. This place is HAPPENING! The city has boomed and is better now that it’s ever been. The number and quality of businesses has increased to keep pace with it’s growing popularity. Water sports are available in Playa del Carmen including swimming, kayaking, snorkeling, scuba diving, sailing, fishing, para-sailing, skydiving and tons more. Great shopping and international cuisine can be found along Playa del Carmens „“Quinta Avenida“ (or 5th Avenue) pedestrian promenade. 5th Avenue is The place to see and be seen in the tourist zone and it’s located one block off the beach, adjacent to the „“Zocalo“ (main square) in central Playa del Carmen. High European fashion can be seen on the streets most every night. 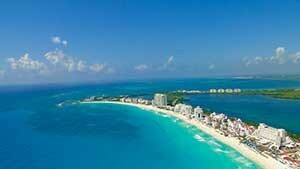 Youth flock to Playa del Carmen, especially from Europe, to party and relax in its tropical Bohemian atmosphere. There is a large variety of international disco’s and clubs here if you enjoy music and dancing. The history of Cancun dates back to 1967 when the Mexican government, recognizing the importance of tourism to the country’s economic future, Cancun was it’s focus. Cancun was a part of the ancient Mayan civilization and is still considered the gateway to El Mundo Maya (the Mayan World). Today Cancun has the distinction of being the one Caribbean destination with the infrastructure, modern amenities (spruced up in 2006) and service philosophy to rival leisure destinations worldwide. Unlike many other parts of the Caribbean and Mexico, Cancun was built for tourism, and continues to meet the needs of its over 3.3 million annual visitors. 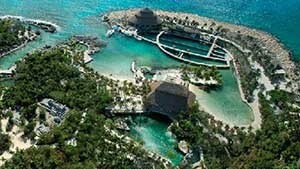 Cancun delivers to travelers the best of many worlds: the Caribbean and Mexico; modern and ancient; action packed and laid back. Here you can find familiar restaurant brands like TGI Fridays, Hard Rock Café, and Chilis. With several large malls you’ll find world class shopping with shops from the likes of Dolce & Gabbana, Gucci, Luis Vuitton, and so many more.